The biggest gaming news of the 26th of September. Since that is now out of the way, let’s look at some news. Cable companies, such as Warner, Comcast, and Verizon, are considering offering video game streaming services similar to OnLive. If this is true, this service could be offered as early as next year. The Mass Effect Trilogy is going to be bundled into one game and released on November 6th for $59.99, and you know what that means. 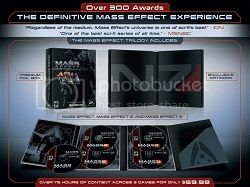 Mass Effect 1 is coming to Ps3! I am really excited for this, although I already have Mass Effect 2. Also, another trilogy is coming along in November, but only for Ps3. The Assassin’s Creed Ezio trilogy is getting launched on November 13th for $39.99. I feel that these three announcements are huge. What is your opinion on each one. Should cable companies get involved in video games? Should the Ezio Trilogy come to Xbox 360 and PC? Leave your thoughts in the comments below! All three Ezio games for $40 dollars isn't bad if you are new to the series, especially considering I payed about 3x that for only two of the games.I hope there will be more bundles as this gen of consoles ends. Good work, just changed the title and reformatted the images (for most things you want the text to word wrap around the images).Also, remember to use impressive, HD slide images. They shouldn't be HD as in large, just clear. The first was a tad blurry. As a Ps3 owner, that confuses me a bit as well. PC gets bundles like this all the time, so they aren't losing much.